A dark, wet and windy Thursday evening in February. I am browsing through a couple of thousand of scanned photos that my father took across London just after the war. Negatives, many of them on old nitrate film that are now being viewed on technology not imagined when these photos were taken. I have long wanted to find the current locations of these photos and see how London has since changed. Where to start? One photo stands out as the logical start point for my journey. 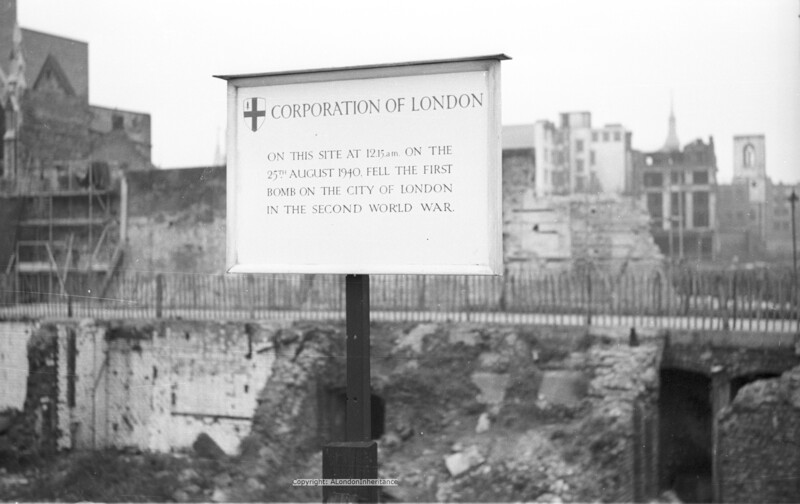 It represents the point where the impact of the Second World War first came to central London. The start of the destruction of the city and the resulting rebuilding during the following 65 years. I print out the photo and a couple of days later find myself standing in Fore Street. This photo was taken in Fore Street just after the war. The Corporation of London have erected a sign to mark this point as the location where the first bomb fell on the city. After this first attack on the 25th August 1940, heavy bombing started on Saturday September 7th and continued for the next 57 nights. London then endured many more months of bombing including the night of the 29th December 1940 when the fires that raged were equal to those of the Great Fire of 1666. Hundreds of people were killed or injured, damage to property was enormous and 13 Wren churches were destroyed. Or the night of the 10th May 1941 when over 500 German bombers attacked London. The alert sound at 11pm and for the next seven hours incendiary and high explosive bombs fell continuously across the city. Behind the sign is a devastated landscape, not a single undamaged building stands, to the right of the photo, the shell of a church tower is visible. All this, the result of months of high explosive and incendiary bombing. Fore Street is between Moorgate Station and the Museum of London and is in the shadow of the Barbican buildings and the towering office blocks along London Wall. 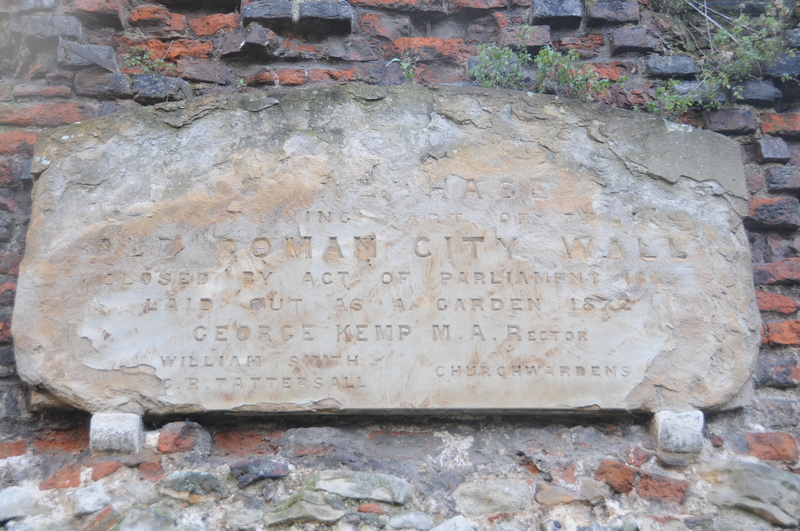 The temporary sign has long gone and was replaced by a stone plaque on the building that stands at the end of Fore Street where it leads into Wood Street, however my visit is not well timed. 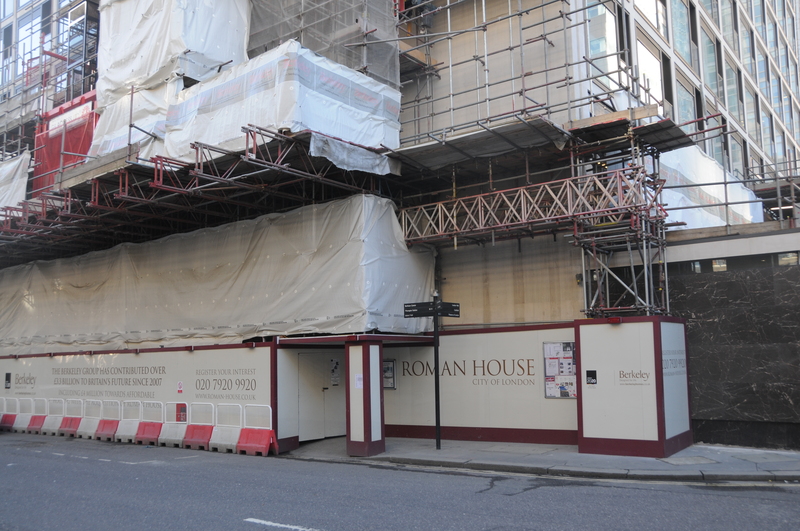 As is typical with London buildings, the one with the plaque is going through a refurbishment and the side is completely covered. I just hope that in the enthusiasm for rebuilding, this marker of a key event in London’s history will survive. The plaque should be on the wall behind all this building work. But does anything from the original photo survive? Unlikely, but I decide to look around. 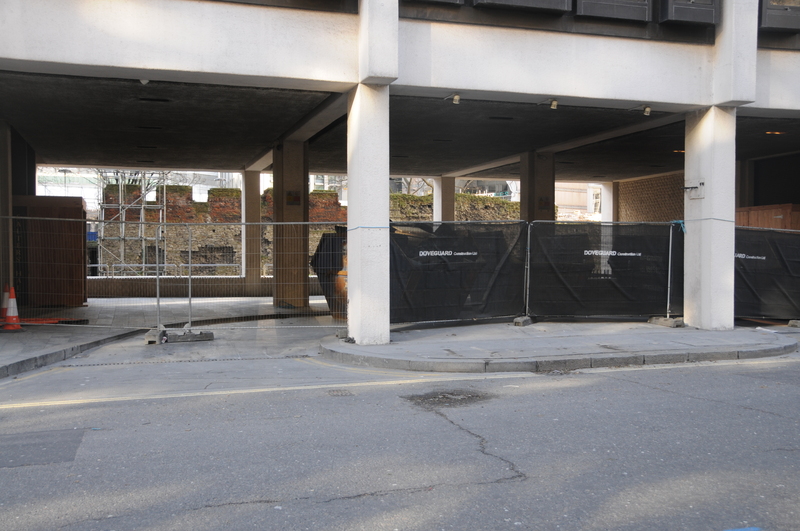 Behind the fencing in the original photo, there is a wall, walking down Fore Street and looking through the building entrance I see a wall, castellated on the top on the left of the wall and straight topped to the right. The wall I see through the gap looks the same as the wall in the original photo (although the angle is different, the original must have been taken towards the corner of Fore Street and Wood Street). 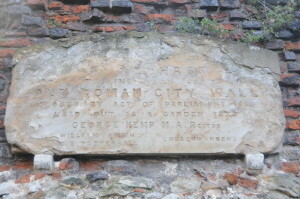 I find my way to the back of the building to a small garden, the former churchyard of St Alphage and here stands the wall, a lengthy section of the old Roman Wall. The garden is small, surrounded on all sides by towering offices and I suspect, the majority of the day in their shadow. Despite all the building of the last 65 years, there are many locations like this throughout the city. To me, they are the deep foundations of the city, anchoring the city to the bedrock of history reaching back to the Roman foundation of the city as a commercial centre. 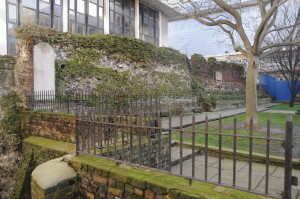 Apart from the Roman Wall, the only other structure that may have survived is the church tower seen in the right hand edge of the original photo. 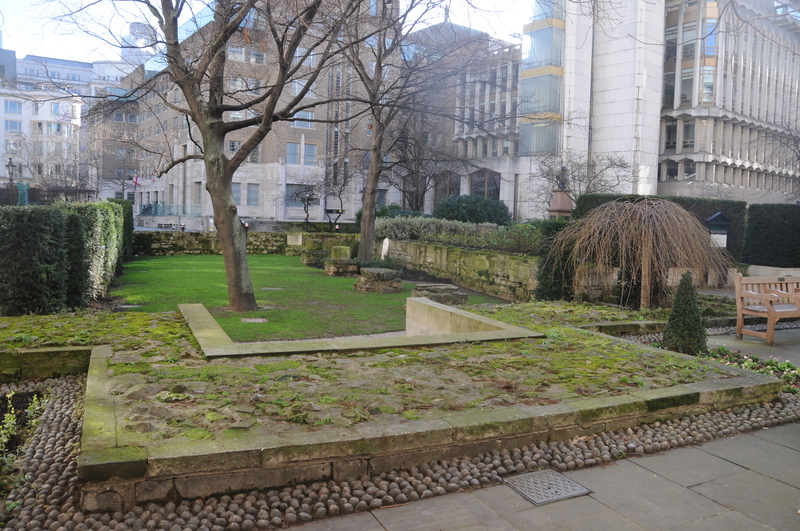 The city of London originally had dozens of churches and many of these still survive, if not as working churches, but as the remaining shell of the building, or just a single tower. 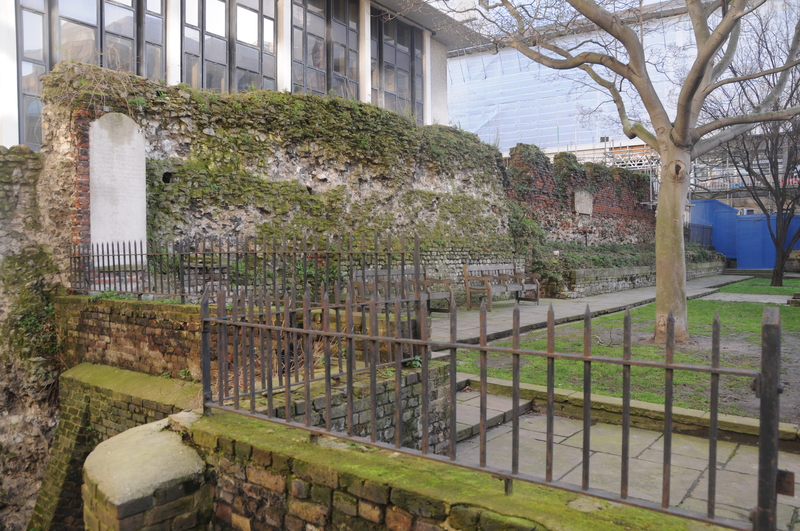 If the church tower still stands, it is hidden behind the office blocks of London Wall, so a quick walk across London Wall in the general direction of where the church should be found. photo. Checking the map, the alignment with the original photo looks right. 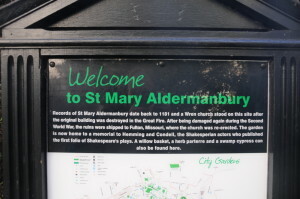 This is the site of St Mary Aldermanbury. Records of a church on this site date back to 1181. The original church was destroyed in the Great Fire of London in 1666. 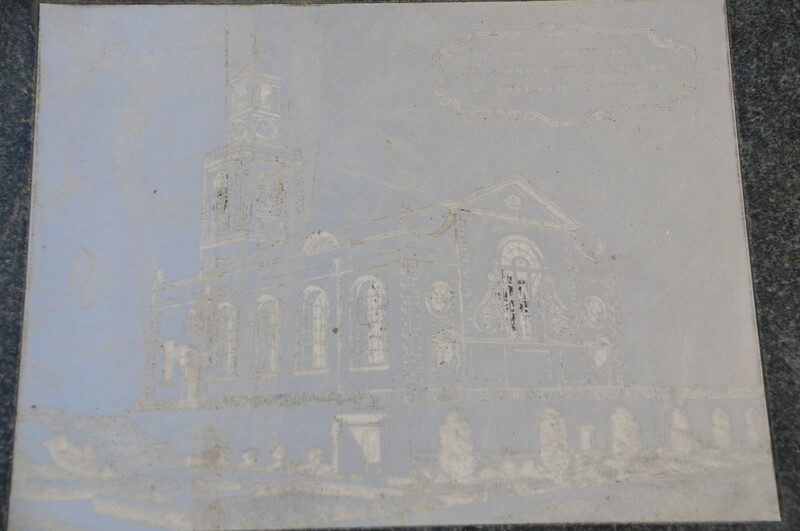 As with so many other churches destroyed during the Great Fire, a Wren church was rebuilt on the site. This is the church that was damaged in Second World War. Scaffolding surrounds the Church of St. Mary in London, England. 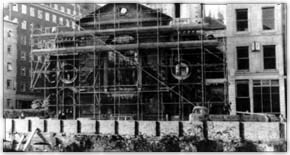 After the war, the heavily damaged church had the unique distinction of being taken apart, shipped to Fulton, Missouri in the USA in 1965, and rebuilt to mark the visit of Churchill to Westminster College in 1946. The church now sits above the National Churchill Museum. 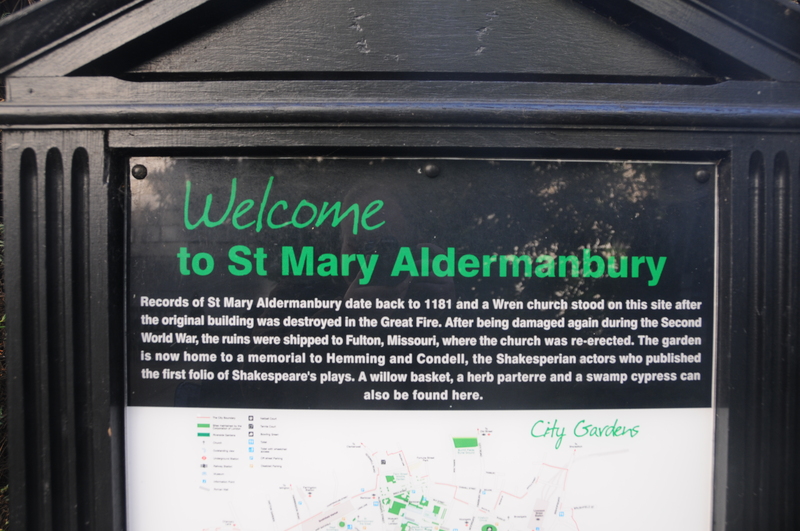 St Mary Aldermanbury now rebuilt at the National Churchill Museum. The tower is the church tower that can be seen in the background of the original photo. The National Churchill Museum can be found here along with more information on the move and rebuilding of the church. I wonder how many of the many thousands of people who work next to these locations, who walk along these streets everyday, understand the history around them. Despite the incredible amount of construction work over the past 65 years and which continues with buildings getting higher and more out of touch with their immediate surroundings, there is still so much to be found across the city. That is my first photo. 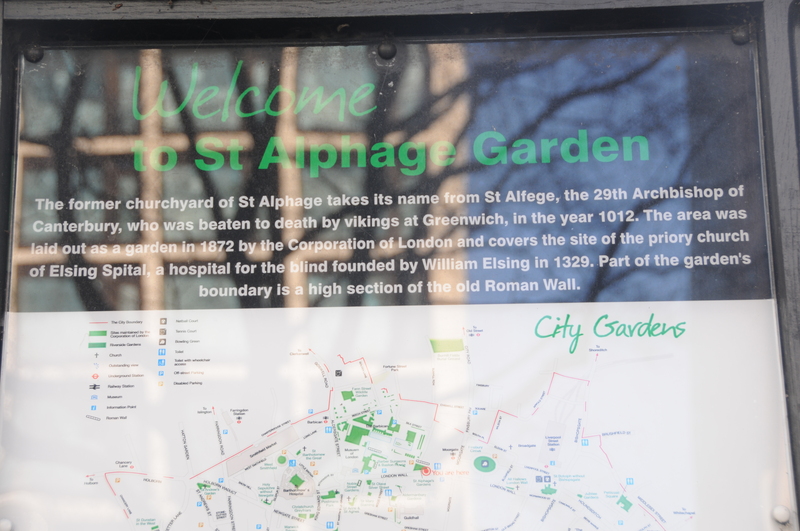 My next stop is another city garden, where nearby I find an almost fantasy like link to another world, followed by a walk to the Thames to explore a wider view of London. 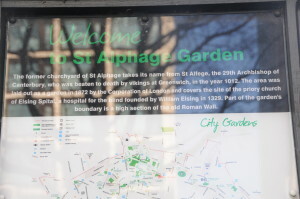 This entry was posted in London Churches, The Bombed City and tagged Churchill, Fore Street, National Churchill Museum, St. Mary Aldermanbury on February 24, 2014 by admin. Love it. Inspirational journey and first, not to be deterred by another mega building site, or anything else, post. Thanks for the link. Have not seen that video before. Fascinating blog at Cemetery Club. Worked in Bermuda once and remember the very bright and vivid colours of many of the churches. Found an interesting picture of what I think is St Mary’s also with St Albans (I think). It’s on the daiyl mail website (of all places) – 10th picture down. Made me scratch my head a bit to locate this – but I think I’ve got it! Mike, thanks for the link. A remarkable set of photos, I have not seen this photo of the church before. Yes, I believe you are right that the church is St. Mary’s. There is part of a church on the left of the photo. This would be St. Alban of which only the tower remains today in Wood Street.